Yay Steelers!!! How much fun is this going to be??? Even I am excited and while I always want the Steelers to win, I really never watch the games unless it gets to this level of excitement. My family says I'm not worthy to join in now since I'm such a fair weather fan. I may even go buy a jersey to wear for the Super Bowl. 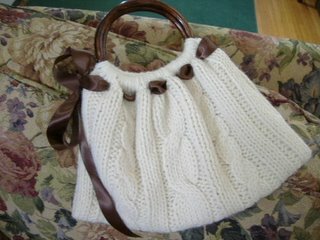 I finished the large Erin bag and it will be on it's way to London this afternoon. I wish I could be on MY way to London this afternoon! As you can see, the handles are really too small for the bag but it was the best I could do. I hope the girl likes it. I finished one red sock and made some progress on the second one. Then I put another few rows on the baby sweater sleeve. All in all it was a busy weekend and I really didn't knit as much as I would have liked. I intended to knit all day Sunday but work got in the way of that. Of course I was home in time for the Steeler game though. Now that I have Steeler fever, I want to knit Steeler socks for everyone. Good thing I don't have time because I don't need to add any more projects to my already overloaded list. Sounds like a good Christmas idea for this year though. I got my hair cut very short on Saturday. I feel like myself again. I'm not sure why I try to let it grow. It drives me crazy for a few months and then I just go and get it cut again. Anyhow I love it..... and I found out the girl who cuts my hair is pregnant and may not return to work after the baby is born. Yikes. She does such a great job. She's been cutting my hair for about 5 years. The bag looks great. Here we go...to the Motor City!!! BTW, I love short hair and wish that my husband would. I'm a wash and wear type of person. I envy you. I love that bag! What pattern is it?